Woodbury, NY— Mitch Goldstone and Carl Berman knows a market when they sees one, especially when analog meets digital. Goldstone and Berman have been running their photo lab in Orange County, California, for 18 years, along with the company website at 30minphotos.com since the late 1990s. Where his business was once 100 percent film-based, he now handles zero film, having made a full transition to digital. But, all those analog prints people have festering in their photo albums or shoeboxes still represent a huge market. It’s estimated that the average consumer has as many as 5,000 analog prints, accumulating to an overall figure of 3.5 trillion prints worldwide. A vast majority of those may have never seen a scanner, and thus have never been digitized. In 2005, Goldstone pioneered a high-speed photo scanning service in his photo lab by commercializing Kodak technology. He launched a new website called ScanMyPhotos.com and recently began using Kodak’s Adaptive Picture Exchange (APEX), a modular dry lab, scaleable photo system. APEX dr amatically increases the speed of workflow management, which partly explains how it enables ScanMyPhotos to scan tens of thousands of prints in a single day. And this is the key reason they can turn orders very quickly, Goldstone says. ScanMyPhotos.com offers the scanning service in three options. The first, and most popular, is the prepaid service at a cost of $124.95. 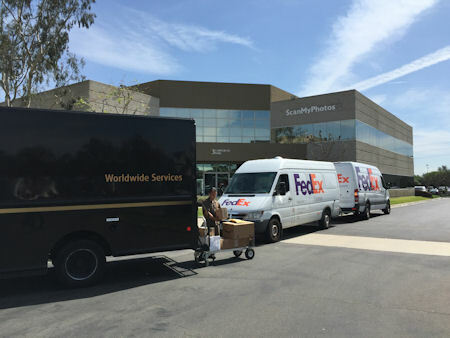 The company sends the customer a postage-paid box they can fill up with as many as 1,800 prints of various sizes (from 2x3 to 11x14). Customers then have up to one year to fill up the box and send it back for scanning. The scanned images are saved as JPEGs, with a resolution of 300 dpi, and burned to a DVD. Each DVD can typically hold about 3,000 4x6 images, but the number can shift depending on how many wallet-size or enlarged photos are part of an order. The other two service options are live support through the phone or real-time online chat, along with simply walking into the store and dropping off a box of prints. Customers walking in with an order of 1,000 prints typically wait just 15 minutes to have the job done. Sometimes, walk-in orders can be far more substantial. Goldstone recalls one customer who came to his lab from San Francisco with 26 boxes containing 22,000 pictures. He dropped off the entire order and left for the day to Disneyland, returning five hours later to pick up the boxes and the DVDs containing all the scans. Having so many photos digitized creates additional profit opportunities. Goldstone says some customers create albums, mugs, cards and other gift items using those photos. This is equally true for converting old home movies on VHS to DVD. ScanMyPhotos.com offers this service in a similar format, where customers can fill up a prepaid box with up to 14 tapes at a cost of $249.95. Individual tapes can be digitized for $24.95 apiece. Just like the photo scanning service, ScanMyPhotos won’t digitize any copyrighted VHS tapes. And, the service is meant only for VHS tapes, so the company won’t take 8mm or movie film. “The poor quality of VHS means they start to deteriorate within 8 to 10 years, so most people’s tapes from the 1980s are almost destroyed,” Goldstone says. “That means there’s a 100 percent market out there for transfer to DVDs.” He cites the recent fire at the film and video vaults at Universal Studios as one example to remind consumers to back up VHS tapes and DVDs by making multiple copies and keeping them in separate locations. The service has been a hit since the company launched it, particularly because consumers from all over the world are paying for it. The only catch for foreign customers is that they have to supply their own boxes and pay for shipping both ways. The prepaid boxes are only for U.S. customers because of agreements ScanMyPhotos.com has with the USPS, FedEx and UPS. The same is also true for photo scanning services. Goldstone’s company has no membership program in place, and he says there are no plans to start one. Instead, they will randomly include Chevron gas cards valued at $5 up to $25, or chocolates, cookies and other gift cards, depending on the time of year. And it’s a business model that’s been successful and can be profitably replicated. When was the last time you scanned 22,000 prints?